Burn Rate - What Does It Mean? What does the term "burn rate" mean in the world of finance? What is the definition of the term "burn rate"? The "burn rate" is the rate at which a company is burning through their available cash. For instance - let's say that you start an Internet company and investors give you $500,000 to fund your operations. You don't have much in the way of revenues to start, though your expenses are significant. After doing some accounting, you realize that you are spending $30,000 per month more than you are taking in. In this case, your "burn rate" would be $30,000 per month. Unless you managed to significantly increase your revenues while keeping your expenses in line, you would have less than two years until you needed more money. 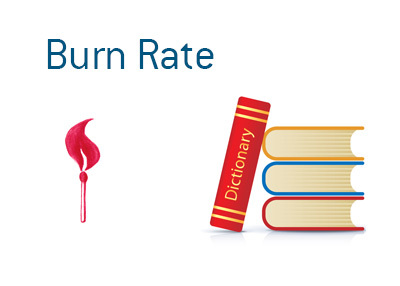 The term "burn rate" became very popular during the first Internet boom. At the time, companies having high "burn rates" were considered great investments, as it meant that they were heavily banking on significantly increased growth in the future. Companies that were making money, believe it or not, were ignored and even belittled.